The successful development and implementation of autonomous vehicles will require significant advancement of sensor technology. Automotive robotics will advance from today’s camera and sonar driver-assist modalities through increasing levels of sensitivity, accuracy, and resolution to a fully driver-less state. Full automation will require a complete sensor ecosystem, utilizing both vehicle and terrestrial based sensors, supported by massive computing power capable of processing life and death decisions in milliseconds. Just consider the massive increase in complexity of managing tens of thousands of autonomous vehicles per square mile compared to aviation automation where volumetric spacing are measured in cubic miles for most of the distance traveled. The sensor suite will include LIDAR, where the reflection of laser pulses is used to measure the size, spacing, distance, and velocity of objects surrounding the moving vehicle. 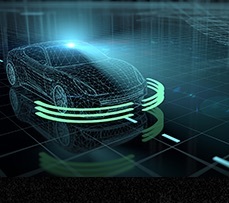 Today’s automotive LIDAR prototypes use high power incoherent laser arrays. The spatial resolution is limited by their divergent beams. This restricts their working distance, a factor that will be most important at highway speeds. Complex scanning and sophisticated software will compensate in the near term, but the inherent design limitations of incoherent LIDAR will limit its useful speed-distance envelope. Coherent LIDAR, by contrast, uses a spatially coherent, narrow linewidth laser to produce a focused beam capable of discriminating small objects approaching at high speeds. This increases the useful speed-distance envelope. Photodigm DBR lasers are monolithic semiconductors with beam properties consistent with the requirements of coherent LIDAR, making them key components for optimized systems. Furthermore, by bringing more of the optical functionality to the chip, Photodigm DBR lasers offer semiconductor economics, with its vanishingly small marginal cost of production. This enables the scalability necessary to achieve the producibility and affordability required in the automotive sector. Photodigm stands alone as the world’s leading producer of high power DBR lasers. Please contact Photodigm for more information about our diffraction-limited DBR lasers.